Superpowers aren’t all they are cracked up to be. I know, because I hear sounds that most other people cannot (least of all my husband). This is not always a plus considering I make a living through technology — the kind that beeps, buzzes and hums nonstop. I was in Idaho to escape the cacophony of daily life on a white-water rafting trip down the wild and scenic Middle Fork of the Salmon River. No cellphones, no Internet access, no motorized equipment or transportation. Just quiet isolation in an extraordinary and untouched area of federally designated wilderness. Mother Nature quickly reminded me that she is anything but silent. Then I heard the roar of the waves. More than a roar, this was the forceful, pounding sound of millions of cubic feet of water being pushed through one of the deepest gorges in North America. The noise filled my head before my neoprene-clad feet even hit the boat. For the rest of the trip, that roar was the soundtrack that accompanied the rugged beauty of the scenery and the drumbeat that urged me to paddle as if my life depended on it — which it sometimes did. When the mad rush of icy water wasn’t trying to wash me out of the paddle boat, it was moving massive, megaton boulders at the bottom of the river bed. Deep rumbling sounds were interspersed with sharp staccato cracks that echoed off the steep canyon walls. At night, the sound of rushing water put me to sleep only to wake me up a few hours later. More than once, I was sure that the ocean was outside the tent door, waiting to swallow me whole. The sound of water wasn’t the only orchestral element of this symphony, however. There was the whooshing of the wind through the yellow pines, the whirring of insects in the hot sun, the chirping of songbirds, and the occasional flop of a fish falling back under the surface of the water. Silence had eluded me. Yet my ears weren’t ringing and my nerves weren’t jarred. Even the campground clatter — the popping of a campfire, the clanking of coffee mugs, the chitchat of my fellow adventure travelers — was a soothing comfort at the end of the day. Thanks to the speed at which the river pushed the paddle boats downstream, I also had more time on solid ground to hike through some of the most pristine and untouched wilderness areas of the world. Occupied by bighorn sheep, elk, wolves, cougars and bears, this is land that until recently had been touched only by its original human inhabitants, the Shoshone Indians. Evidence of their presence is still visible in the toppled stones that once served as foundations, pithouse dwellings and faded pictographs on granite walls. From craggy canyons to alpine meadows to deep green forests, the constantly changing terrain ensured that all of my senses were engaged. Icy river waters contrasted with natural hot springs. Ponderosa pine trees gave off the scent of vanilla from their bark. Millions of bright stars punctuated a dark night sky. Entering the Frank Church-River of No Return Wilderness is like stepping back hundreds of years to a time when the country was still undeveloped and technologically unsophisticated (in a good way). As for modern technology, I admit that I was grateful for my snazzy LED headlamp during the dark of night and for the camp stoves that produced coffee early in the morning. 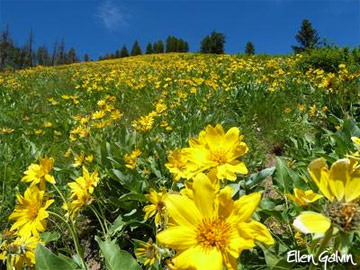 I was also happy to have my digital camera on hand for a 5,000-foot elevation gain hike to the snow line, which passed through an alpine meadow filled with stunning yellow and purple wildflowers as far as the eye could see. Still, the memory that resonates the most is the drumming “WHOOMP, WHOOMP” sound of a proud male grouse, strutting through the tall grass in search of a feathered mate. His is just one of many sounds that have stayed with me, much like the land and the river themselves: untouched, unchanged and wildly soothing for the soul.